AMENDING RULE 16 OF THE RULES OF THE SENATE OF THE TWENTY-NINTH LEGISLATURE OF THE STATE OF HAWAII. AUTHORIZING THE PRESIDENT TO APPROVE THE JOURNAL OF THE SENATE ON THIS FINAL DAY OF THE FIRST SPECIAL SESSION OF 2017. INFORMING THE HOUSE AND GOVERNOR THAT THE SENATE IS READY TO ADJOURN SINE DIE. RELATING TO PUBLIC EMPLOYMENT COST ITEMS. ELECTING THE VICE SPEAKER OF THE HOUSE OF REPRESENTATIVES OF THE TWENTY-NINTH LEGISLATURE. ACKNOWLEDGING AND RECOGNIZING AMENDMENTS TO THE CAUCUS LEADERSHIP OF THE HOUSE OF REPRESENTATIVES OF THE TWENTY-NINTH LEGISLATURE. AMENDING THE STANDING COMMITTEES AND COMMITTEE ASSIGNMENTS OF THE HOUSE OF REPRESENTATIVES OF THE TWENTY-NINTH LEGISLATURE. Resolution amending Rule 12 of the Rules of the House of Representatives. 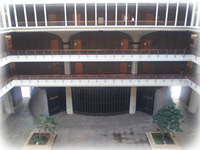 AMENDING THE RULES OF THE HOUSE OF REPRESENTATIVES OF THE TWENTY-NINTH LEGISLATURE OF THE STATE OF HAWAII TO ESTABLISH THE COMMITTEE ON HEALTH AND HUMAN SERVICES. URGING THE UNITED STATES DEPARTMENT OF DEFENSE TO ENSURE THAT HAWAII AND GUAM ARE SAFE FROM NORTH KOREAN MISSILES. EXPRESSING ALOHA AND SUPPORT FOR THE RESIDENTS OF HOUSTON AND THE PEOPLE OF TEXAS AFFECTED BY HURRICANE HARVEY. AUTHORIZING THE SPEAKER OF THE HOUSE OF REPRESENTATIVES TO APPROVE THE JOURNAL OF THIS HOUSE OF ANY LEGISLATIVE DAY BEING COMPILED AS OF THE 5TH LEGISLATIVE DAY. AUTHORIZING AND DIRECTING THE COMMITTEE ON THE JOURNAL TO COMPILE AND PRINT THE JOURNAL OF THE HOUSE OF REPRESENTATIVES, SPECIAL SESSION OF 2017, PURSUANT TO RULE 18 OF THE RULES OF THE HOUSE OF REPRESENTATIVES. INFORMING THE SENATE AND THE GOVERNOR THAT THE HOUSE OF REPRESENTATIVES IS READY TO ADJOURN SINE DIE. Submitting for consideration and confirmation to the Endangered Species Recovery Committee, Gubernatorial Nominee, LISA SPAIN, for a term to expire 06-30-2021. Submitting for consideration and confirmation to the Endangered Species Recovery Committee, Gubernatorial Nominee, LOYAL MEHRHOFF, for a term to expire 06-30-2019. Submitting for consideration and confirmation to the Public Utilities Commission, Gubernatorial Nominee, JAMES GRIFFIN, for a term to expire 06-30-2022. Submitting for consideration and confirmation to the State Board of Nursing, Gubernatorial Nominee, KAREN BOYER, for a term to expire 06-30-2018. Submitting for consideration and confirmation to the Board of Certification of Operating Personnel in Wastewater Treatment Plants, Gubernatorial Nominee, RONALD HAY, for a term to expire 06-30-2020. Submitting for consideration and confirmation to the Disability and Communication Access Board, Gubernatorial Nominee, MARIE KIMMEY, for a term to expire 06-30-2021. Submitting for consideration and confirmation to the Disability and Communication Access Board, Gubernatorial Nominee, SCOTT FLEMING, for a term to expire 06-30-2019. Submitting for consideration and confirmation to the Emergency Medical Services Advisory Committee, Gubernatorial Nominee, BRENT ROBINSON, for a term to expire 06-30-2020. Submitting for consideration and confirmation to the Policy Advisory Board for Elder Affairs, Gubernatorial Nominee, JOY MIYASAKI, for a term to expire 06-30-2021. Submitting for consideration and confirmation to the Policy Advisory Board for Elder Affairs, Gubernatorial Nominee, SARAH YUAN, for a term to expire 06-30-2021. Submitting for consideration and confirmation to the Policy Advisory Board for Elder Affairs, Gubernatorial Nominee, SUZANNE SCHULBERG, for a term to expire 06-30-2021. Submitting for consideration and confirmation to the State Council on Mental Health, Gubernatorial Nominee, LOUISE CRUM, for a term to expire 06-30-2020. Submitting for consideration and confirmation to the Statewide Health Coordinating Council, Gubernatorial Nominee, JILL MIYAMURA, for a term to expire 06-30-2021. Submitting for consideration and confirmation to the Enhanced 911 Board, Gubernatorial Nominee, ROBERT GAUSEPOHL, for a term to expire 06-30-2020. Submitting for consideration and confirmation to the Commission on Fatherhood, Gubernatorial Nominee, DAVID MATTOS, for a term to expire 06-30-2020. Submitting for consideration and confirmation to the Board of Directors of the Hawai‘i Housing Finance and Development Corporation, Gubernatorial Nominee, DONN MENDE, for a term to expire 06-30-2021. Submitting for consideration and confirmation to the Hawai‘i Medical Education Council, Gubernatorial Nominee, SHARON VITOUSEK, for a term to expire 06-30-2021. Submitting for consideration and confirmation to the Board of Registration of the Island of Hawai‘i, Gubernatorial Nominee, SHAWN MERRILL, for a term to expire 06-30-2019. Submitting for consideration and confirmation to the State Foundation on Culture and the Arts Commission, Gubernatorial Nominee, CLYDE SAKAMOTO, for a term to expire 06-30-2020. Submitting for consideration and confirmation to the State Foundation on Culture and the Arts Commission, Gubernatorial Nominee, NALANI BRUN, for a term to expire 06-30-2021. Submitting for consideration and confirmation to the State Foundation on Culture and the Arts Commission, Gubernatorial Nominee, SHERMAN WARNER, for a term to expire 06-30-2021. Submitting for consideration and confirmation to the Board of Trustees of the Deferred Compensation Plan, Gubernatorial Nominee, BRIAN MOTO, for a term to expire 06-30-2021. Submitting for consideration and confirmation to the Board of Trustees of the Deferred Compensation Plan, Gubernatorial Nominee, KENNETH VILLABRILLE, for a term to expire 06-30-2021. Submitting for consideration and confirmation to the Hawai‘i Workforce Development Council, Gubernatorial Nominee, DWIGHT TAKAMINE, for a term to expire 06-30-2020. Submitting for consideration and confirmation to the Board of Taxation Review, 3rd Taxation District (Hawaii), Gubernatorial Nominee, CHRISTOPHER HANNIGAN, for a term to expire 06-30-2020. Submitting for consideration and confirmation to the Land Use Commission, Gubernatorial Nominee, GARY OKUDA, for a term to expire 06-30-2021. Submitting for consideration and confirmation to the Land Use Commission, Gubernatorial Nominee, LEE OHIGASHI, for a term to expire 06-30-2020. Submitting for consideration and confirmation to the Land Use Commission, Gubernatorial Nominee, LINDA ESTES, for a term to expire 06-30-2021. Submitting for consideration and confirmation to the Land Use Commission, Gubernatorial Nominee, NANCY CABRAL, for a term to expire 06-30-2021. Submitting for consideration and confirmation to the Kane‘ohe Bay Regional Council, Gubernatorial Nominee, CLAYTON HANAGAMI, for a term to expire 06-30-2021. Submitting for consideration and confirmation to the Kane‘ohe Bay Regional Council, Gubernatorial Nominee, CLIFFORD LOO, for a term to expire 06-30-2021. Submitting for consideration and confirmation to the Language Access Advisory Council, Gubernatorial Nominee, CARI UESUGI, for a term to expire 06-30-2020. Submitting for consideration and confirmation to the Civil Rights Commission, Gubernatorial Nominee, JOAKIM PETER, for a term to expire 06-30-2019. Submitting for consideration and confirmation to the Western Interstate Commission for Higher Education, Gubernatorial Nominee, COLLEEN SATHRE, for a term to expire 06-30-2021. Submitting for consideration and confirmation to the Board of Regents of the University of Hawai‘i, Gubernatorial Nominee, DOUGLAS SHINSATO, for a term to expire 06-30-2018. Submitting for consideration and confirmation to the Commission on Fatherhood, Gubernatorial Nominee, CALEB MILLIKEN, for a term to expire 06-30-2020. Submitting for consideration and confirmation to the Stadium Authority, Gubernatorial Nominee, BRENNON MORIOKA, for a term to expire 06-30-2021. Submitting for consideration and confirmation to the Stadium Authority, Gubernatorial Nominee, AUDREY ABE, for a term to expire 06-30-2021. Submitting for consideration and confirmation to the Small Business Regulatory Review Board, Gubernatorial Nominee, REG BAKER, for a term to expire 06-30-2018. Submitting for consideration and confirmation as Deputy to the Chairperson of the Department of Land and Natural Resources, Gubernatorial Nominee, ROBERT MASUDA, for a term to expire 12-03-2018. Submitting for consideration and confirmation to the Aha Moku Advisory Committee, Gubernatorial Nominee, KEITH ROBINSON, for a term to expire 06-30-2020. Submitting for consideration and confirmation to the Aha Moku Advisory Committee, Gubernatorial Nominee, WILLIAM KAHOLOAA SR., for a term to expire 06-30-2020. Submitting for consideration and confirmation to the Aha Moku Advisory Committee, Gubernatorial Nominee, RICHARD HOOPII, for a term to expire 06-30-2020. Submitting for consideration and confirmation to the Aha Moku Advisory Committee, Gubernatorial Nominee, LESLIE KULOLOIO, for a term to expire 06-30-2020. Submitting for consideration and confirmation to the Aha Moku Advisory Committee, Gubernatorial Nominee, FRANCES KALUHIWA, for a term to expire 06-30-2020. Submitting for consideration and confirmation to the Aha Moku Advisory Committee, Gubernatorial Nominee, PIILANI KAAWALOA, for a term to expire 06-30-2020. Submitting for consideration and confirmation to the Aha Moku Advisory Committee, Gubernatorial Nominee, THOMAS HASHIMOTO, for a term to expire 06-30-2020. Submitting for consideration and confirmation to the Aha Moku Advisory Committee, Gubernatorial Nominee, WINIFRED BASQUES, for a term to expire 06-30-2020. Submitting for consideration and confirmation to the State Boxing Commission of Hawaii, Gubernatorial Nominee, MICHAEL FREITAS, for a term to expire 06-30-2020. Submitting for consideration and confirmation to the Policy Advisory Board for Elder Affairs, Gubernatorial Nominee, LINDA AXTELL-THOMPSON, for a term to expire 06-30-2021. Submitting for consideration and confirmation to the Board of Dental Examiners, Gubernatorial Nominee, PEARL ARRINGTON, for a term to expire 06-30-2021. Submitting for consideration and confirmation to the Board of Dental Examiners, Gubernatorial Nominee, SHARON TANAKA, for a term to expire 06-30-2019. Submitting for consideration and confirmation to the Hawai‘i Community Development Authority Heeia District, Gubernatorial Nominee, JO-ANN LEONG, for a term to expire 06-30-2021. Submitting for consideration and confirmation to the Hawai‘i Community Development Authority Heeia District, Gubernatorial Nominee, DONNA CAMVEL, for a term to expire 06-30-2018. Submitting for consideration and confirmation to the Hawai‘i Community Development Authority Kalaeloa District, Gubernatorial Nominee, MAEDA TIMSON, for a term to expire 06-30-2021. Submitting for consideration and confirmation to the Hawai‘i Community Development Authority Kakaako District, Gubernatorial Nominee, PHILLIP HASHA, for a term to expire 06-30-2021. Submitting for consideration and confirmation to the Hawai‘i Community Development Authority Kakaako District, Gubernatorial Nominee, JASON OKUHAMA, for a term to expire 06-30-2021. Informing the Senate that on 08-25-2017, the Governor has withdrawn REG BAKER, Gubernatorial Nominee to the Small Business Regulatory Review Board, from consideration by the Senate (GM39). Submitting for consideration and confirmation as the Chairperson and Representative of the Public of the Hawai‘i Labor Relations Board, Gubernatorial Nominee, MARCUS OSHIRO, for a term to expire 06-30-2018. Submitting for consideration and confirmation as the Chairperson and Representative of the Public of the Hawai‘i Labor Relations Board, Gubernatorial Nominee, MARCUS OSHIRO, for a term to expire 06-30-2024. Submitting for consideration and confirmation to the Hawai‘i Sister State Committee, Gubernatorial Nominee, JEAN ROLLES, for a term to expire 06-30-2020. Informing the Senate that on 08-30-2017, the Governor has withdrawn KEITH ROBINSON, Gubernatorial Nominee to the Aha Moku Advisory Committee, from consideration by the Senate (GM41). Informing the Senate that on 08-30-2017, the Governor has withdrawn WILLIAM KAHOLOAA SR., Gubernatorial Nominee to the Aha Moku Advisory Committee, from consideration by the Senate (GM42). Informing the Senate that on 08-30-2017, the Governor has withdrawn RICHARD HOOPII, Gubernatorial Nominee to the Aha Moku Advisory Committee, from consideration by the Senate (GM43). Informing the Senate that on 08-30-2017, the Governor has withdrawn LESLIE KULOLOIO, Gubernatorial Nominee to the Aha Moku Advisory Committee, from consideration by the Senate (GM44). Informing the Senate that on 08-30-2017, the Governor has withdrawn FRANCES KALUHIWA, Gubernatorial Nominee to the Aha Moku Advisory Committee, from consideration by the Senate (GM45). Informing the Senate that on 08-30-2017, the Governor has withdrawn PIILANI KAAWALOA, Gubernatorial Nominee to the Aha Moku Advisory Committee, from consideration by the Senate (GM46). Informing the Senate that on 08-30-2017, the Governor has withdrawn THOMAS HASHIMOTO, Gubernatorial Nominee to the Aha Moku Advisory Committee, from consideration by the Senate (GM47). Informing the Senate that on 08-30-2017, the Governor has withdrawn WINIFRED BASQUES, Gubernatorial Nominee to the Aha Moku Advisory Committee, from consideration by the Senate (GM48). Letter dated August 23, 2017, transmitting two drafts of collective bargaining bills to fund agreements with the University of Hawaii Professional Assembly, Unit 7, and the United Public Workers, Units 1 and 10. Informing the Legislature that on September 5, 2017, the Governor signed the following bill into law: SB4 (ACT 001). Informing the Legislature that on September 14, 2017, the Governor signed the following bill into law: SB3 (ACT 002). Informing the Legislature that on September 21, 2017, the Governor signed the following bill into law: SB2 (ACT 003).